Welcome to Costello, a leader in cutting edge alternative and renewable energy plant design. As Consulting Engineers, we are in the forefront of renewable and alternative energies. We focus our attention on design services in support of alternative energy projects; including Biodiesel, Syngas and Biogas. To help our clients reach their goals we provide cost effective plant design unparalleled in the industry, offering environmentally sound, low polluting plants that utilize fresh or waste vegetable oils and animal fats as feed stocks for the production of biodiesel. Based on numerous site assessments one plant design does not fit every situation. Our engineering services determine exactly what is needed for your facility. Biodiesel contributes to the longevity and cleanliness of diesel engines. The most likely use of biodiesel is for specific markets that require a cleaner-burning, biodegradable fuel. Biodiesel is economical, its production is comparatively inexpensive, and is good for the environment. It keeps money flowing to those that “grow” feedstock and can be produced from renewable resources. With more than 25 years of experience, Costello understands the inherent problems regarding the use of methanol. We design completely safe facilities that fully comply with the National Electric Code, NFPA guidelines, ASME codes, API codes, OSHA and local and state requirements. We offer multiple reaction technologies along with a complete post-transesterification treatment technology. Our designs remove trace sodium and potassium catalysts, sodium and potassium soaps and trace glycerin. The Recovery of methanol is by distillation followed by dehydrating the methanol for recycling back to the front of the plant. As biodiesel is a biodegradable transportation fuel produced through transesterification of organically derived oils or fats, it is the safest fuel to store and handle, is non-toxic, biodegradable, provides less dependence on fuels, offers higher efficiency and durability, and yields environmental benefits. The demand for biodiesel as an alternative, cost effective fuel is rapidly growing and has fast become the wave of the future. COSTELLO can provide upgrades and retrofits to existing Biodiesel plants that can include improvements in instrumention and controls, transesterification reactors, phase separators, distillation units or add-on esterification units to handle free fatty acids (FFAs). Our BioflexplantSM process can expediently convert the widest range of animal fats, vegetable oils, yellow grease and nontraditional plant oils including jatropha, camelina, castor bean and algae to ASTM biodiesel. Change over takes less than one hour. 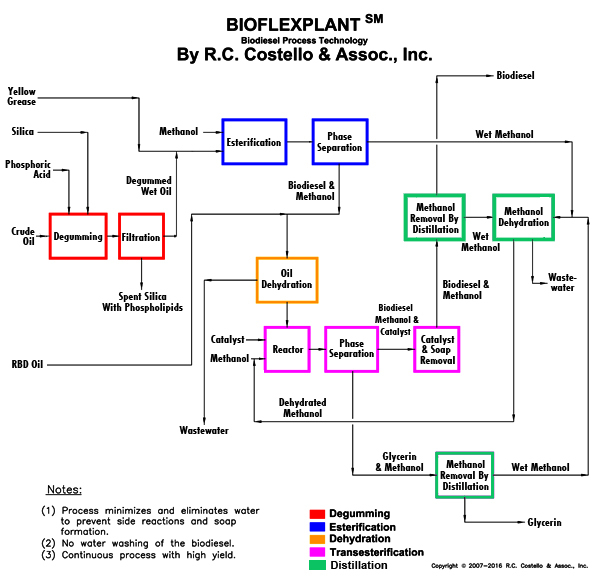 BioflexplantSM is modular in nature, featuring transesterification with Process Intensification for both smaller installations and those plants producing over 20,000,000 gallons per year. Here is a high level flow sheet depicting the transesterication section of our premier process technology. Our Biodiesel meets ASTM guidelines and our crude glycerin is methanol free. BioflexplantSM can easily insure that you meet the 15 ppm sulfur specification when using animal fats. Our highly experienced engineers provide plant design, start-up support, troubleshooting, training, second opinion reviews and revamp services that increase biodiesel plant capacity. Because our standing in the biodiesel community precedes us, countless businesses from a multitude of industries are benefiting from our expertise and have come to depend upon our far-reaching expertise. If you are ready to learn more about BioflexplantSM, we are prepared to assist you with the design of your facility.